In January 2016, 30 youth leaders from across the country journeyed to the snowy splendor of Wyoming’s Grand Teton National Park to tackle some tough questions: What is it like to visit a national park and feel that there’s no one else there who looks like you? What are the best ways to connect local community members—who may think that national parks “aren’t our thing”—with the natural, cultural, and historic National Park System resources that exist in their own backyards? 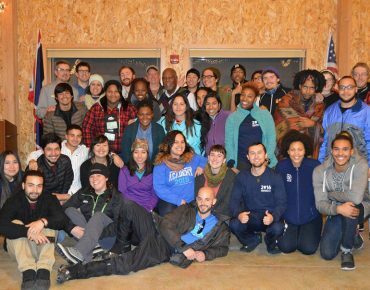 The youth leaders had gathered to kick off Mountains to Main Street, an exciting new initiative to actively engage under-represented urban communities that don’t typically visit national parks. Leveraging the leadership and community-mobilization expertise of the program participants to serve as Mountains to Main Street Urban Ambassadors when they return home, the program aims to connect urban communities with the natural, cultural, and historic resources in their own backyards. Coinciding with the National Park Service (NPS) centennial year and aligned with the NPS Urban Agenda, Mountains to Main Street is a collaboration between Groundwork USA, the Student Conservation Association, and Teton Science Schools, and made possible by funding from the Grand Teton National Park Foundation and Grand Teton Association. Over the course of a week filled with intensive trainings, workshops, presentations, and lots of snowshoe hikes, the 18-to-25-year old Mountains to Main Street participants – including 20 Groundwork youth leaders – learned from each other and from guests such as Grand Teton National Park Superintendent David Vela and former National Park Service Director Bob Stanton. Diversifying national park audiences isn’t as simple as organizing a field trip. That strategy has been tried again and again with limited success. Instead, Mountains to Main Street program participants have approached the “diversity gap” challenge by crafting engagement programs tailored to meet the needs of their home communities while involving a local NPS resource as a collaborator and/or source of inspiration. Through this innovative approach, the youth leaders hope to forge lasting relationships between parks and communities that will endure long after the Mountains to Main Street program has ended. Since they’ve returned home, the newly minted Mountains to Main Street Urban Ambassadors have developed logistical strategies, collaborated with NPS personnel to develop programs attractive to diverse audiences, and crafted effective messages to engage them. Cheria Caldwell, Program Assistant for Groundwork Indy in Indianapolis, IN, designed a program to provide urban youth with a national park experience that addressed some of the anger management and conflict resolution challenges they face on a daily basis. Cheria’s program, “Shedding Light on Dark Situations,” brought 24 Green Team and community youth of color to engage in team-building and conflict resolution activities while exploring the caves of Mammoth Cave National Park in Kentucky. 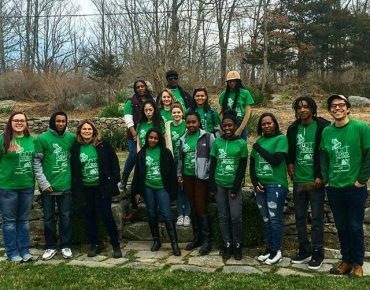 Tanner Burgdorf, Groundwork Bridgeport’s Program Manager, brought high school students and their families to Weir Farm National Historic Site in Wilton, CT, to enjoy the outdoors and create self-expressive art. Participants The “Let’s Get Weir’d at Weir Farm National Historic Site” event addressed youths’ desire to be creative, feel like an “expert,” and develop interpersonal skills. The youths explored and documented the Weir Farm site through cell phone photography, then shared their photos with the group and with peers via Instagram using the #WeirdatWeir hashtag. Ashley Perez, former Groundwork Hudson Valley Green Team member and current Groundwork USA Board member, created a Mountains to Main Street program to bring elementary school youth to the Jamaica Bay Gateway National Recreation Area in New York City to improve science education through place-based learning. Follow the Mountains to Main Street program progress on social media at #Mountains2MainStreet.